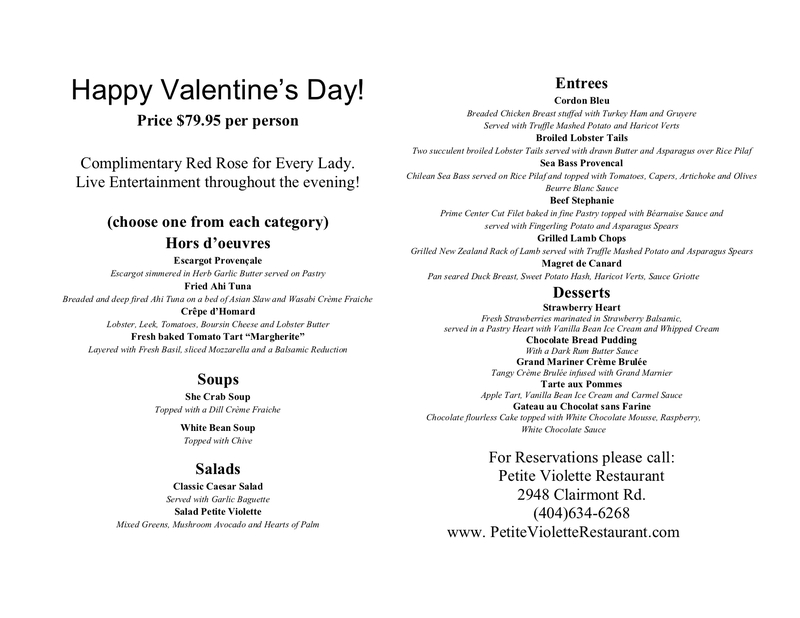 Make reservations now for a special Valentine’s Day Menu onThursday, February 14th, from5:30 to 9:30 p.m. The prix fixe five-course holiday meal costs$79.95 per person (plus tax and gratuity) and offers a choice of each of premium hors d’oeuvres, piping-hot soup, fresh salad, gourmet entrée—like twin Broiled Lobster Tails, Filet of Beef Stephanie, or Sea Bass Provencal—and decadent dessert. The meal also includes a complimentary rose for every lady and live entertainment throughout the evening. We will not be serving our regular dinner menu on Valentine's Day. Please call 404-634-6268, now, to reserve your spot.